I was a tiny bit worried last week. I got an email from the chap who organizes my Thursday night figure drawing sessions. He was emailing the group to see if anyone wanted to take over wrangling models as he couldn’t afford the time and the previous person needed to step down. Oh no! How would I get my practice in now? I’m in the same boat as most of the folks who come to these drawing sessions, I have a job, and a commute, and precious little free time. So I was of no use to help. I went online and found some inexpensive stock photo resources for artists. A lot of the available poses are…dumb. Theatrical or overwrought. But I did find a few good portrait references. Now I can keep up my practice. A couple of days later another email arrived and model wrangling had been solved. Figure drawing Thursdays are back on, starting in February. Lucky me. 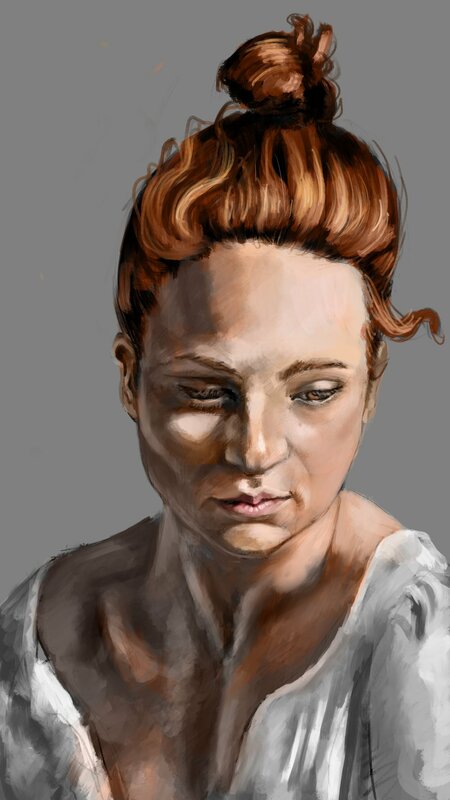 I think portraits are some of the best practice you can get for drawing and painting. It’s immediately apparent when any thing is wrong or even just a little off. It’s difficult to capture a likeness, it’s difficult to capture light on skin. Faces have complex topology and heads are just shaped funny. When the results are good, though, they can be magical. You begin to empathize with the person in the picture, to connect with them as if they are real. Here, this woman looks down and to her left. The pose and lighting suggest getting up early, before the sun, sitting in the light from a single lamp on a night stand. I learned, or re-learned, or remembered, recently that value - the light to dark - is more critical than color for creating an image that feels solid and real. After creating a thorough enough sketch to map out the geometry of the model, I focused entirely on value, painting entirely in greyscale. Then I came back and painted in color on top. This is a very old fashioned method but it applies just as well to digital painting.